Here we come with information about U.S. Banana Republic Cardmember exclusive coupon. 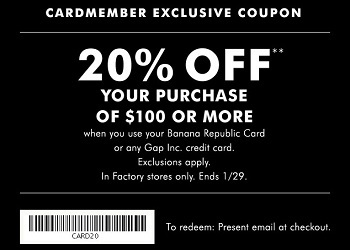 Use your Banana Republic Card or any Gap Inc. credit card and get 20% discount on your purchase of $100 or more + show a special coupon to cashier during the checkout at any U.S. Banana Republic Factory Store Location. You can get your coupon through Banana Republic emailing. Offer is valid until January 29, 2017. For more details about the offer visit any U.S. Banana Republic Factory Store Location or Banana Republic Factory Online.